SolidSteel parametric is a parametric 3D CAD steelwork solution, integrated into SOLIDWORKS by 100%. Using the powerful and user-friendly functions for constructions, there are no limits to your creativity. The software is not branch-specific and can be used for classic steelwork, as well as for plant and mechanical engineering. Create complex steel constructions fast and efficient, including the typical steel connections. 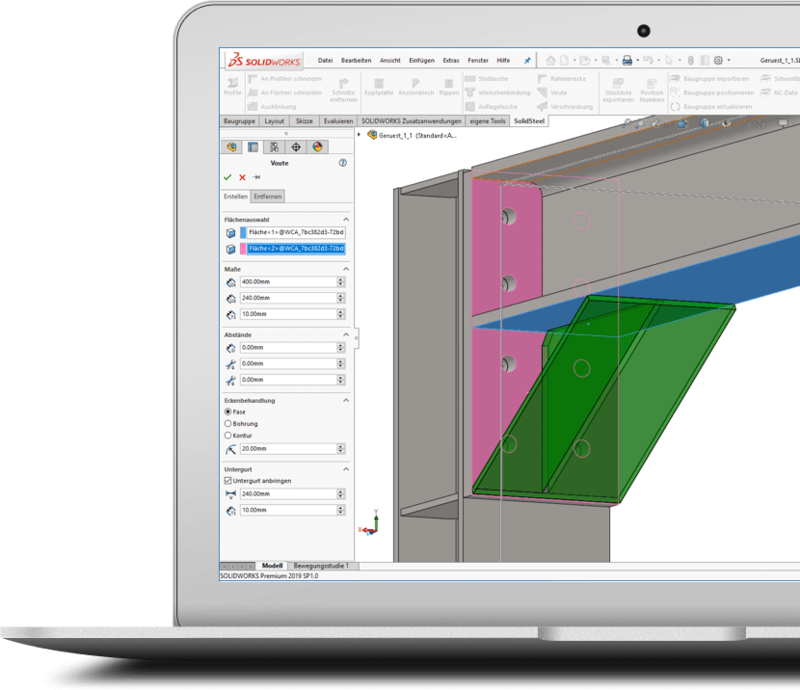 With SolidSteel parametric even complex connection types can be created with a few clicks and all connected beams will be extended, shortened or modified. Of course fully automatic and conforming to standards. SolidSteel parametric for SOLIDWORKS is not just a software solution for steelwork. It is integrated into SOLIDWORKS by 100%. In the case of the user interface of SolidSteel parametric we adopted the way of the standard SOLIDWORKS user interfaces. So the user will not notice, that he is working with a third party software product. With many functions its much faster to select several objects in only one step. Our new multi select function support makes the construction process faster, much easier and more comfortable. For placing profiles we added a new preview function. After selecting the system line, the virtual profile will be visible immediately. Now you can change the position of the profile and the type. After clicking apply, the profile will be finally placed. For the construction process, comfort was very important for us. 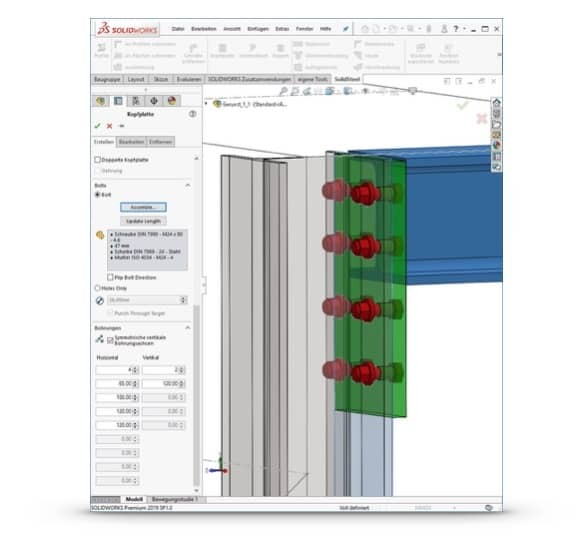 With SolidSteel parametric for SOLIDWORKS, typical steel connections like end plates, gusset plates or frame corners are not just placed within seconds. For example the intelligent selection of the software provides the correct end plate for the selected profile. Therefor different libraries like DAST are available which can be extended ad lib. Additional to the usual end plates, there is the possibility to add clip angle connections of I beams to the construction. If the flange of the transverse beam hits the flange of the main beam, a typical steel notch will be placed at the transverse beam. The main connection is made with clip angles which will be screwed together with both parts. This connection type is a standard DAST connection, too. With the frame corners, SolidSteel parametric provides the possibility to implement very complex connections between steel beams. The frame corners are available in different types. All frame corners have in common, that a complex assembly with many different parts will be created automatically with only one function. Of cause this assembly in integrated into SolidSteel parametric by 100%. An important following process of a steel construction is the export of the NC data in DSTV Format. These data sets can be send directly to the manufacturing machines. No matter if sawing angles, cope cuts or boreholes. All these necessary information for manufacturing are stored in the NC data files. The NC data module is available as an separated module for SolidSteel parametric for SOLIDWORKS. During the creation of the typical steel connections, the bolts and complete bolt sets can be selected. Therefor we have our comfortable bolt assistant which is part of every SolidSteel parametric installation. Additionally to single bolts, complete bolt sets can be selected. Those bolt sets can be arranged individually (number of washers and their position, number of nuts, length of the bolt and so on). With default settings, the bolt dialogue assumes necessary values like the clamping length automatically from the 3D design. With changed of the design (for example: Thickness of an end plate has changed), the clamping length will be changed automatically. Of cause including the standard HV bolt sets. We will keep you up to date about the development and latest campaigns round about SolidSteel parametric for SOLIDWORKS. Just sign up for the SolidSteel parametric Newsletter. Free of charge and without any obligation. After the registration you will receive periodically information about steelwork & SOLIDWORKS.